performance measures are provided in the tables of this press release. toward a subscription model,” said Duston Williams, CFO of Nutanix. 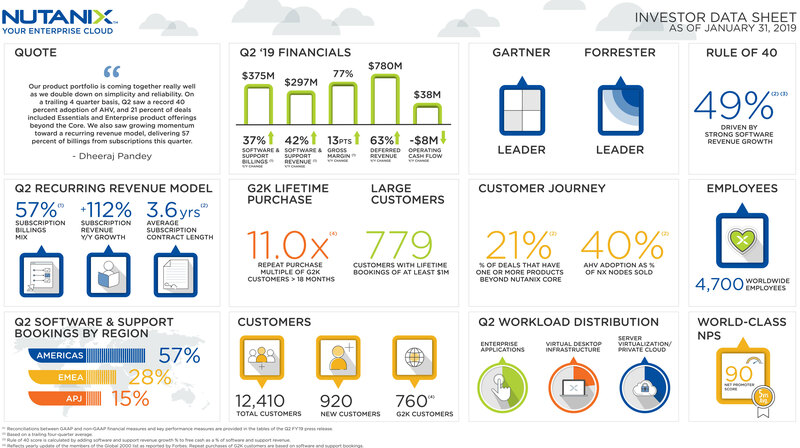 end-customers, adding 920 new end-customers during the quarter. Harris Corporation, IHG, Komatsu America Corp., and Nedbank. they continued their datacenter modernization journey with Nutanix. personal benefits of the Nutanix platform. seamlessly deliver applications across platforms. 1-800-585-8367 or 1-416-621-4642, and entering the conference ID 6887822.
measure to evaluate our business. expenses and non-GAAP net loss per share for future fiscal periods. are based on our current expectations, estimates, opinions, and beliefs. Consequently, you should not rely on these forward-looking statements. quarter ended October 31, 2018, filed with the SEC on December 10, 2018.